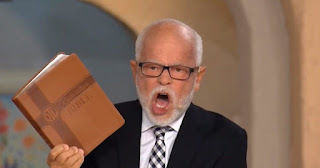 On his television program , End Times prepper pastor Jim Bakker said that God had told him that the first horse of the Apocalypse has been released on earth and that President Trump was elected in order to give Christians time to prepare for the Last Days. Video is shown below. Bakker said that while “the Antichrist spirit” has been let loose on America.